The story begins from a school in Pakistan, where school children have imprisoned by the crusaders (Jehaadi). After death of Nagraj crusaders do not fear anyone. To protect the children Nagu come in Nagaraj's disguises and got trapped himself. Then Sudangi and Sheetnaag come but they also fail. Scene 1: A Good-Nature Unknown Man in Kolkata with Naganand and Nagnath. He assumed the commands of a voice echoing in his head and is on an unknown journey. Scene 2: Hiroshima, Japan- All major villains are sure about Nagraj's death. And now they are preparing to celebrate. But along with the celebration Supreme Hood wants to unite and gather all major terrorist leaders from all around the world. Scene 3: Nitro (New International Terrorist Removal Organization) has been activated. Z label commandos of Nitro are ready to infiltrate terrorist camps and eliminate them. Scene 4: Arabian Sea, In the starting of his journey Good-Nature Unknown Man is in front of the marine pirates boss Nadarg. Along with the other prisoners he is being transported to sell in the slave market of Baghdad. Nadarg is Nagdant actually, who had been living secretly for fear of Nagraj. To defending the slaves the Good-Nature Unknown Man collided with Nadarg with the help of Naganand and Nagnaath. On the instructions of the sound resonating in his mind he invokes the serpents by playing Snake Vina. With the help of Naganand, Nagnaath and other serpents he defeated Nadarg in this battle and uncage the slaves. The Slaves are now free only because of him, they give him a name -Masaya means An Angel Sent by God. Scene 5: Iraq-Syria Border, Nitro commandos Shango, Susan, Samayra and Tovoor infiltrates in terrorist camps. They eliminate all the terrorists and leave Baghdadi (Head Terrorist) alive. Baghdadi reached to his boss Paradox and Paradox offers him unbeatable Snake-Powers. Scene 6: In Nagdweep, Visarpi is disconsolate while remembering her past with Nagraj. To honor its commitment at the time of Nagraj's death, she is willing to go to the journey to end the terrorism. Scene 7: African Rainforest, The Good-Nature Unknown Man is now reached to the African Rainforest, in the heartland of Thodanga. Where he is caught by the tribal and taken to Thodanga. Thodanga is upset of his old age, weakness and aging of the body. The Good-Nature Unknown Man expressed his wish of fighting all alone against Thodanga. Scene 8: Time magazine's headquarters New York, Khudabaksh who works there got a list of those who sponsor the crusader group(Jehaadi). But before publishing the list it gets attacked headquarters by Bagdadi with the help of Venom Force. Baghdadi burned Khudabaksh along with the disc. Sudangi tried to stop Baghdadi but in both Naag and Tantra powers Baghdadi dominates on Saudangi. Death was gradually moving towards Sudangi Suddenly he comes between Sudangi and Death. A Green-Man, using snakes to eliminate the enemies. Saboteur snakes (Dwansak Sarp) are coming out of the Hawthorn snake's (Naagfani Sarp) mouth and Hawthorn snakes resides only in Nagraj's body on this earth. 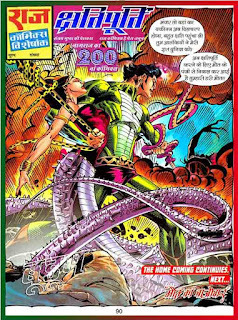 Highly Poisonous Upcoming Comics- "Moat Ka Baazigar"
Kshatipurti the 200th Title of Nagraj for which we had been waiting for two years. Firstly I would like to say, the name Kshatigrast is much reasonable for this comic. Let me tell you, at first the name of this comics was decided "Kshatigrast". 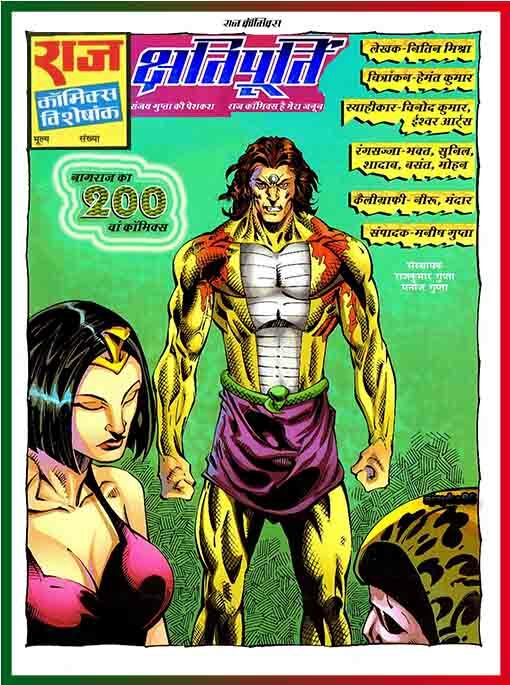 But the readers wanted "Kshatipurti" as the name of the 200th comics of Nagraj. On the request of readers, Raj Comics team renamed it to "Kshatipurti". The name "Kshatipurti" does not justify the comics. Have not seen any kind of Compensation(kshatipurti) anywhere in the entire comics. Whether it be the Nagraj or of terrorism. The story is good enough and the artwork is too fantastic. As expected by the readers. Nitin Mishra sir is showering embers from the pen. Work of Hemant sir is extremely commendable. 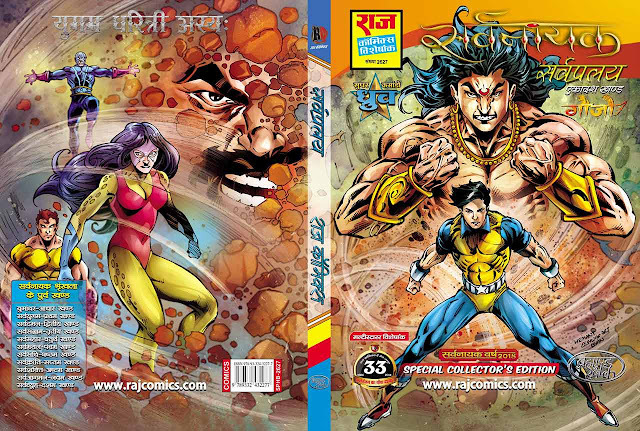 Jointly good effort by the whole Raj Comics Team. Chapter 00: The Quest begin, Chapter 00 the first time I've heard. Of course everything comes from zero. But, it is always shown with one. The counting always begin from 1 not from zero. I think its caused accidentally, here Chapter 01 was supposed to be. Nitro commandos Susan and Samayra were brought captive to terrorist camp. But when they freed, from where did they get their dress? Despite of having Gem(Naagmani), Nagu was shown very weak but in actual he is not. Many times he helped Nagraj in worst and critical moments. The comics is completely fresh. Nothing is repeated. You will not realize at all, when you have reached the last page. The comics is full of action, emotion, drama, thrill, adventure, mystery and especially suspense. Green page to be in the comics is a big plus in my view. No matter how much powerful is he, how amazing are his powers. After all, he is a human being and he's not beyond death. Nitin Mishra sir has shown this fact in a very excellent way. He tried to bring the reality in the story. Now in what way he bring back Nagraj, this would be interesting and worth watching. Sure, you should read the very best comics. क्या ये नागराज है जो सौडांगी को थामे हुए है? अगर हाँ तो कैसे? नागराज तो मर चुका है? राज कॉमिक्स की आगामी बेहद ज़हरीली पेशकश- "मोैत का बाज़ीगर"
नाइट्रो के कमांडोज़ सुसान और समायरा बंदी बना कर आतंकबादी कैंप लायी गयी थी। आज़ाद हो कर उनको उनकी ड्रेस कहाँ से मिली?